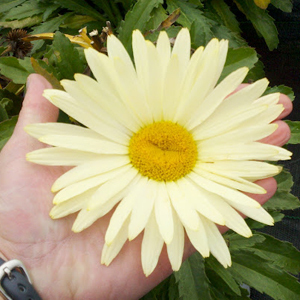 In a recent walk through the greenhouse I found this Shasta Daisy Leucanthemum ‘Banana Cream‘ blooming. I took this picture in my hand so you can see how large these blooms are. I love the double row of petals on this bloom. 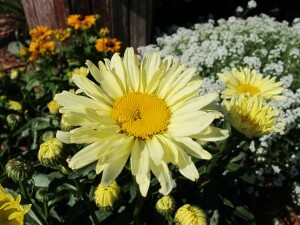 The butter yellow color of ‘Banana Creme‘ make this different from the traditional Shasta Daisy. Blooming from summers beginning to summers end, ‘Banana Creme’ will add a beautiful splash of color all summer. Take a different twist with your perennials, try planting them in a container as a thriller and adding annuals in as fillers and spillers. Be sure to check out all the great Proven Winners Plants that are part of the P Allen Smith Collection. 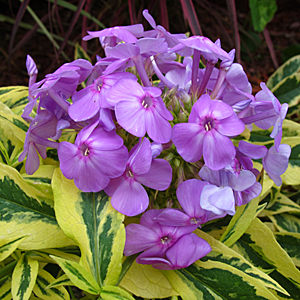 It is no shock that this new Tall Garden Phlox has been added to the Proven Winners Perennial line new for Fall 2011. Starting off Phlox Shockwave has a shocking interest! 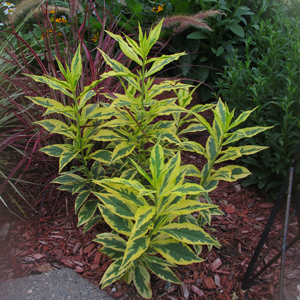 The variegated foliage has a wow factor all of it’s own. The striking contrast of the deep green and bright yellow foliage is amazing. The 12-18″ upright habit of this new tall Phlox is compact enough for most gardens yet stands tall enough to steal the show. The fragrant lilac flowers of Shockwave compliment well with the green and yellow foliage. Shockwave is a new introduction to the Proven Winner Perennial line for Fall of 2011. I have really been impressed with the Phlox Shockwave that I have in my garden, above the picture shows your the beautiful contrast of colors. And below is a picture before it started to bloom, the foliage, like I said, has enough color of its own. Phlox Shockwave landscape shot before flowering. This is its first summer. Did you know that Proven Winners is introducing a new line up of perennials this fall? One of my favorites in this new collection is Leucanthemum ‘Banana Cream‘. ‘Banana Cream’ is a unique Shasta daisy because it is a butter yellow. The large blooms open up a deep yellow color and then slowly fade out to white as the bloom matures. Leucanthemum ‘Banana Cream‘ is a profuse bloomer leaving you with color all summer long. To help with the increased bloom time it is recommended to dead head spent blooms.